Polynucleobacter necessarius subsp. 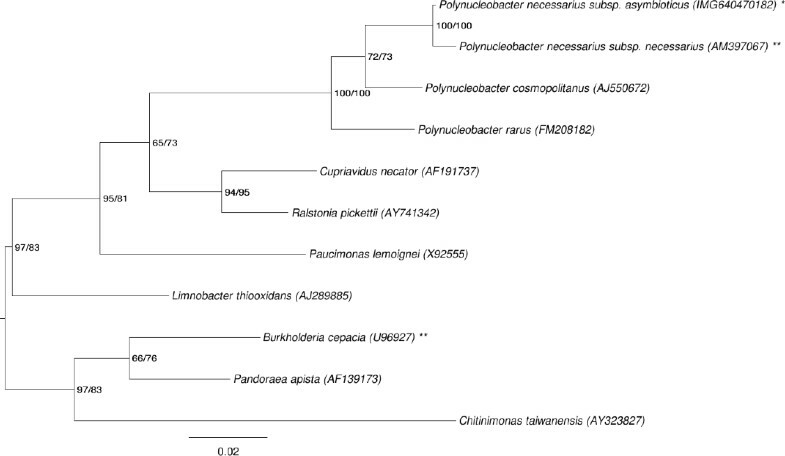 asymbioticus strain QLW-P1DMWA-1T is a planktonic freshwater bacterium affiliated with the family Burkholderiaceae (class Betaproteobacteria). This strain is of interest because it represents a subspecies with cosmopolitan and ubiquitous distribution in standing freshwater systems. The 16S-23S ITS genotype represented by the sequenced strain comprised on average more than 10% of bacterioplankton in its home habitat. While all strains of the subspecies P. necessarius asymbioticus are free-living freshwater bacteria, strains belonging to the only other subspecies, P. necessarius subsp. necessarius are obligate endosymbionts of the ciliate Euplotes aediculatus. The two subspecies of P. necessarius are the instances of two closely related subspecies that differ in their lifestyle (free-living vs. obligate endosymbiont), and they are the only members of the genus Polynucleobacter with completely sequenced genomes. Here we describe the features of P. necessarius subsp. asymbioticus, together with the complete genome sequence and annotation. The 2,159,490 bp long chromosome with a total of 2,088 protein-coding and 48 RNA genes is the first completed genome sequence of the genus Polynucleobacter to be published and was sequenced as part of the DOE Joint Genome Institute Community Sequencing Program 2006. Strain QLW-P1DMWA-1T (= DSM 18221 = CIP 10981) is the type strain of Polynucleobacter necessarius subsp. asymbioticus , which is one of two subspecies in the species P. necessarius . The genus was first named by Heckmann and Schmidt in 1987  in which ‘omicron from stock 15 of Euplotes aediculatus’ was designated as the type species . The genus name was derived from the Greek words polys, numerous, bactrum, rod, and the Latin word nucleus, nut. The species epithet originated from the Latin adjective necessarius, indispensible . ‘Omicron’-like symbionts were known for some time since their isolation from several freshwater Euplotes spp. , and are also known to be essential for the host cells . Only 22 years later, Hahn et al. described a closely related free-living strain, QLW-P1DMWA-1T, which they considered to be another member of the species P. necessarius . The description of P. necessarius subsp. asymbioticus followed several years after the observation that these free-living planktonic bacteria are closely related to P. necessarius and are cosmopolitan in freshwater habitats, occurring in different climatic zones in Europe, Asia and Africa . This observation was confirmed by several cultivation-independent investigations of freshwater bacterioplankton diversity (for review see Newton et al., 2011 ). Furthermore, a systematic survey of almost all stagnant freshwater habitats of a 2000 km2 area located in Central Europe by specific fluorescent in situ hybridization (FISH) probes revealed ubiquity (i.e. presence in all investigated habitats) of free-living P. necessarius . Meanwhile, three more members of the genus were described; P. cosmopolitanus from freshwater lakes and rivers , P. rarus from an acidic lake located in Wisconsin, USA , and P. acidiphobus from a freshwater rock pool located on the Mediterranean island Corsica (France) . Furthermore, the establishment of a fifth Polynucleobacter species, P. difficilis, was recently proposed . Strain QLW-P1DMWA-1T was isolated from a small acidic pond located at an altitude of 1,300 meters in the Austrian Alps near the city of Salzburg . The strain represents a group of closely related strains sharing identical 16S rRNA, 16S-23S ITS and glutamine synthetase (glnA) genes. The group is persistent in the pond and comprises approximately 11% to total bacterioplankton . Here we present a summary classification and a set of features for P. necessarius subsp. asymbioticus QLW-P1DMWA-1T, together with the description of the complete genomic sequencing and annotation. The single genomic 16S rRNA sequence of P. necessarius subsp. asymbioticus QLW-P1DMWA-1T was compared using NCBI BLAST  under default settings (e.g., considering only the high-scoring segment pairs (HSPs) from the best 250 hits) with the most recent release of the Greengenes database  and the relative frequencies of taxa and keywords (reduced to their stem ) were determined, weighted by BLAST scores. The most frequently occurring genera were Polynucleobacter (99.1%) and Polaromonas (0.9%) (103 hits in total). Regarding the 19 hits to sequences from members of the species, the average identity within HSPs was 99.7%, whereas the average coverage by HSPs was 97.8%. No hits to sequences associated with other species names were found. (Note that the Greengenes database uses the INSDC (= EMBL/NCBI/DDBJ) annotation, which is not an authoritative source for nomenclature or classification.) The highest-scoring environmental sequence was DQ234242 (‘determined library mangrove clone DS160’), which showed an identity of 99.9% and an HSP coverage of 99.3%. The most frequently occurring keywords within the labels of environmental samples which yielded hits were ‘aquat, bai, rank’ (9.9%), ‘chesapeak’ (5.3%), ‘delawar’ (4.6%), ‘river’ (4.4%) and ‘freshwat’ (3.1%) (147 hits in total). The most frequently occurring keywords within the labels of environmental samples which yielded hits of a higher score than the highest scoring species were ‘freshwat’ (9.7%), ‘belong, climat, cosmopolitan, habitat, isol, locat, necessariu, polynucleobact, three, zone’ (8.1%), ‘determin, librari, mangrov’ (1.6%) and ‘cultur, lake, watercolumn’ (1.6%) (7 hits in total). Those keywords that refer to habitats fit well with the ecological properties reported for strain QLW-P1DMWA-1T in the original description , whereas others reflect technical information of the studies from which the sequences were generated. Figure 1 shows the phylogenetic neighborhood of P. necessarius subsp. asymbioticus in a 16S rRNA based tree. The sequence of the single 16S rRNA gene copy in the genome does not differ from the previously published 16S rRNA sequence (AJ879783). Phylogenetic tree highlighting the position of P. necessarius subsp. asymbioticus relative to the type strains of the genus and the type species of the other closely related genera within the family Burkholderiaceae. The tree was inferred from 1,483 aligned characters [16,17] of the 16S rRNA gene sequence under the maximum likelihood (ML) criterion . Rooting was done initially using the midpoint method  and then checked for its agreement with the current classification (Table 1). The branches are scaled in terms of the expected number of substitutions per site. Numbers adjacent to the branches are support values from 150 ML bootstrap replicates  (left) and from 1,000 maximum-parsimony bootstrap replicates  (right) if larger than 60%. Lineages with type strain genome sequencing projects registered in GOLD  are labeled with one asterisk, those also listed as ‘Complete and Published’ (as well as the target genome) with two asterisks (see Burkholderia cepacia, CP000151). Cells of P. necessarius subsp. asymbioticus strain QLW-P1DMWA-1T are straight rods, 0.7–1.2 by 0.4–0.5 µm in size . The multiple nucleoid-like structures, which were originally considered to be typical for the cells of members of the genus, are absent in this strain but were observed rarely in some elongated cells of other strains of this subspecies . QLW-P1DMWA-1T cells stain Gram-negative, are catalase- and oxidase-positive, chemoorganotrophic, non-motile, facultatively anaerobic, and non-spore-forming . Cells grow at salt concentrations of up to 0.5% (w/v) NaCl . The pH range for growth was not reported, neither an optimal growth temperature, only a growth range of 5–34°C . The substrate spectrum and biochemistry are reported in detail by Hahn et al. , however, weak growth in complex media and poor growth in media containing a single carbon source hampered more extensive physiological analysis . Data on the structure of the cell wall, quinones and polar lipids are not available for strain QLW-P1DMWA-1T. Major cellular fatty acids are C16:1 ω7c (41.3%), C16:0 (22.2%), C18:1 ω7c (12.9%), summed feature 2 including C14:0 3-OH (9.6%), C12:0 (3.4%), and 11-methyl C18:1 ω7c (3.1%) . All members of P. necessarius lack 2-hydroxylated fatty acids other than C12:0, which can be used for differentiation from members of the genera Ralstonia and Cupriavidus. This organism was selected for sequencing on the basis of the DOE Joint Genome Institute Community Sequencing Program 2006. The genome project is deposited in the Genomes On Line Database  and the complete genome sequence is deposited in GenBank. Sequencing, finishing and annotation were performed by the DOE Joint Genome Institute (JGI). A summary of the project information is shown in Table 2. A culture of DSM 18221 grown aerobically in NSY medium  at room temperature was used to prepare genomic DNA (gDNA) for sequencing. Genomic DNA was extracted by following the CTAB protocol recommended by JGI . The purity, quality and size of the bulk gDNA preparation were assessed by JGI according to DOE-JGI guidelines. Classification and general features of P. necessarius subsp. asymbioticus according to the MIGS recommendations  and the NamesforLife database . Three genomic Sanger libraries: 4 kb pUC, 8 kb pMCL200 and fosmid pcc1Fos libraries. The genome was sequenced using a combination of 4 kb, 8 kb and fosmid DNA libraries. All general aspects of library construction and sequencing can be found at the JGI website . Draft assemblies were based on 28,841 total reads and contained 14 contigs in one scaffold. The Phred/Phrap-/Consed software package was used for sequence assembly and quality assessment . Possible mis-assemblies were corrected with Dupfinisher . Gaps between contigs were closed by editing in Consed, custom priming, or PCR amplification. A total of 1,238 additional reactions were needed to close gaps and to raise the quality of the finished sequence. The error rate of the completed genome sequence is less than 1 in 100,000. Together all libraries provided 12.0 × coverage of the genome. Genes were identified using two gene modeling programs, Glimmer  and Critica  as part of the Oak Ridge National Laboratory genome annotation pipeline. The two sets of gene calls were combined using Critica as the preferred start call for genes with the same stop codon. Genes with less than 80 amino acids, which were predicted by only one of the gene callers and had no Blast hit in the KEGG database at 1e-05, were deleted. This was followed by a round of manual curation to eliminate obvious overlaps. The predicted CDSs were translated and used to search the National Center for Biotechnology Information (NCBI) nonredundant database, UniProt, TIGRFam, Pfam, PRIAM, KEGG, COG, and InterPro databases. These data sources were combined to assert a product description for each predicted protein. Non-coding genes and miscellaneous features were predicted using tRNAscan-SE , TMHMM , and signalP . The genome consists of a 2,159,490 bp long chromosome with a 44.8% G+C content (Table 3 and Figure 2). Of the 2,136 genes predicted, 2,088 were protein-coding genes, and 48 RNAs; 11 pseudogenes were also identified. The majority of the protein-coding genes (76.7%) were assigned a putative function while the remaining ones were annotated as hypothetical proteins. The distribution of genes into COGs functional categories is presented in Table 4. P. necessarius, initially described as a taxon exclusively harboring obligate endosymbionts of E. aediculatus , is one of a small number of bacterial species with a validly published name for which an axenic culture of a type strain does not exist in a public strain collections , all of which predate the introduction of the Candidatus concept . Interestingly, the genome of P. necessarius subsp. 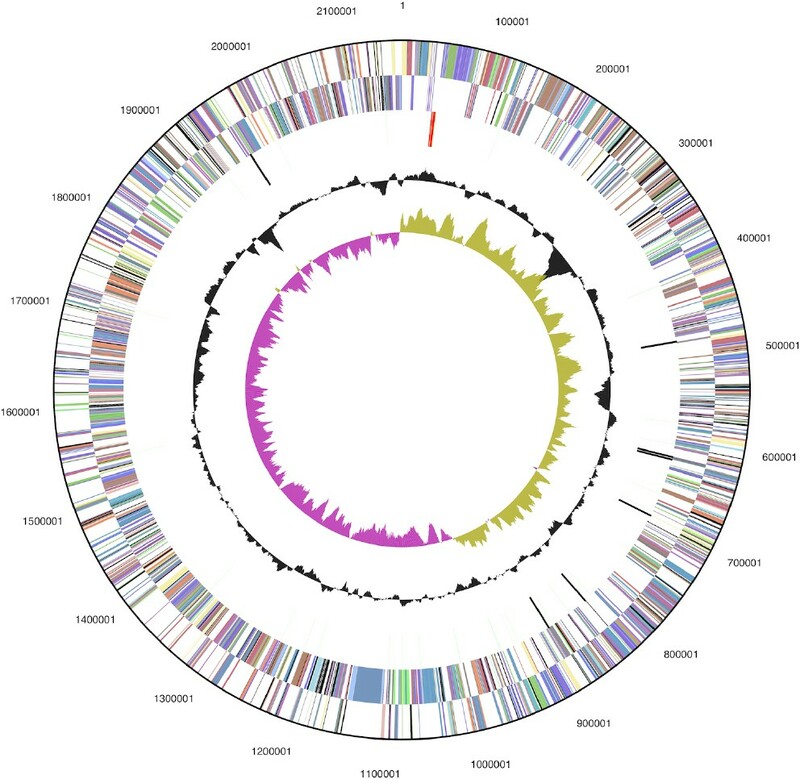 necessarius STIR1, the endosymbiont of the ciliate E. aediculatus STIR1 [42,43] has been sequenced under the same JGI Community Sequencing Program 2006 as the genome of the free-living strain QLW-P1DMWA-1T, and was deposited in the INSDC databases as CP001010. As for taxonomic purposes, however, it is important to note that the endosymbiotic strain STIR1 has not been proposed as the type strain of P. necessarius . Today, P. necessaries would have been designated as Candidatus. At the time P. necessarius subsp. asymbioticus was described , it was not possible to perform a DNA-DNA hybridization to evaluate the degree of relatedness between the two subspecies, because it was not possible to obtain enough DNA of endosymbionts contained in the ciliate culture used for description of P. necessarius. There was insufficient pure genomic DNA obtainable from the type strain of P. necessarius. However, it is now possible to perform a digital DNA-DNA hybridization of the two completed genome sequences of representatives of the two subspecies by means of genome-to-genome sequence comparison [44–46]. The 2,159,490 bp long genome sequence of P. necessarius subsp. asymbioticus QLW-P1DMWA-1T (CP000655, NC_009379) and the 1,560,469 bp long genome sequence of P. necessarius subsp. necessarius STIR1 (CP001010, NC_010531) were used for digital DNA-DNA hybridization via the gbdb-Server . Just like in the conventional wet lab DNA-DNA hybridizations  digital DDH values ≤70% are considered as an indication that the tested organisms belong to a different species . When analyzed with NCBI-BLAST using the three formulas described in [45,46] for the estimation of digital DDH values, the resulting DDH values for strains QLW-P1DMWA-1T and STIR1 were: 40.8% (formula 1), 11.4% (formula 2) and 43.3% (formula 3). Given the low degree of DNA-DNA similarity between the two strains it appears justified to assume that these strains represent different species. However, additional investigations comparing the phylogenetic relationship between the type strain of P. necessarius subsp. necessarius (i.e. the symbionts contained in the E. aediculatus ‘stock 15’ culture ) and the genome-sequenced strain STIR1 are required before a separation of the two subspecies into two different species can be proposed. The work conducted by the U.S. Department of Energy Joint Genome Institute was supported by the Office of Science of the U.S. Department of Energy under Contract No. DE-AC02-05CH11231, and was also supported by grant FWF-P19853 to M.W.H.